Plot and project for a modern house in Denia for sale. Only 1 km from all amenities and 2 to the beach. In the sunny low part of Montgo mountain in a quiet residential area highly demanded. New villas in Denia built to order. 600 m from the town center and 300 from the beach. Only 2 plots available, so reserve now before they go. Different designer villas to choose from can be built . You can change the layout and building materials in advance. Villa for sale in Denia at walking distance to the beach and town. High quality house for sale in Denia 800 m from the sand beach, the new marina and town centre are at 1 km. Summer kitchen, pool 8×4 , well, storeroom, parking for several cars. Quiet dead end street. Not negotiable. Villa for sale in Denia. 1,8 meters from the beach and the new marina with shops and restaurants, 2,5 to town center, The only plots for detached house building near Denia town center and the beach in this moment. Several modern designer villas to choose from that you can customize to your own style and needs. Built with first class materials and very well finished. Built by a company with more than 40 years experience in Denia, Costa blanca north, Alicante, Spain. Come and view the plots available, new builds are much in demand now and are selling quickly. Villas in Denia for sale. 12 villas in a sought after location in Denia, very near town centre and the beach. Villas with two floors with 150 m2 build, 3 bedrooms, 2 bathrooms, plots from 350 to 400 m2. Airconditioning, Garden, Mountain View, Parking, Private Pool, Solarium. The last plots available for detached houses near town and the beach. Reserve your plot now. New houses in Denia for sale. New build high quality modern houses in the nearest plots to town and beach in Denia. Private pool. Carport. No driving. 700m distance to the beach, town center, supermarkets, restaurants, doctors... Very easy to maintain. Internet conexion with fiber optic, city gas. Very high rental income. Perfect investment buy to let property or a place to retire. Only 3 plots available. Villa in Denia for sale, to be built on a flat plot only, 1,5 km from Denia town and beach. Built in 8 months under the new Spanish building specifications. Warranty which gives you a 10 year structural warranty. All building materials are EC homologated. Project includes: Architects project, Town hall permits, Civil responsibility insurance, Quality control. A special house for a special life!Villa for sale in Denia montgo. Impeccable, spacious, with plenty of light, Sun all day and beautifull views to the montgo and the sea. Distributed on two floors, the main floor with 3 bedrooms, 2 bathrooms, one of them in suite, spacious living room with fireplace, kitchen with island and office. Upper floor with Studio with bathroom, also as separate bedroom or for guests with large solarium. Air conditioning hot and cold, heating gas, top standing materials, alarm, well and many extras. Renovated in 2008. Quiet area, close to Denia, schools and all services.A little piece of paradise! House in Denia for sale. PLOT INCLUDED, urban plot with electric and water conexions, flat and south facing, perfect for our Inhaus all in one floor houses with no steps, with swimmingpool or out side jacuzzi. In a quiet street very near to town center and the beach. Very welcoming villa located close to the town centre. Built with first quality materials and distributed over two floors. Livingdining room with cassette fireplace, large kitchen with dining area, 5 bedrooms (two of them on the ground floor), 3 bathrooms, glazed terrace, hotcold.aire conditioning, low consumption electric radiators, water softener, double garage with workshop (45 m²) and automatic door, summer kitchen, oven for bread, storage room. The house has a basement with wine cellar, gym and laundry room. Marble floors. Swimming pool 10 x 5 m with terrace and pergola. beautiful Mediterranean garden with lots of privacy. A house with great charm in a soughtafter area at the foot of the Montgó! This villa was originally built in 1980 and has been refurbished since 2010. The plot measures 1.620 m² and is flat. There is a lovely seaview from the glazed naya, the pool area is very private and has various sitting areas. The main villa has a large interior patio which can be closed or kept open with an automatic roof. There are three bedrooms, of which two are very large measuring at aprox. 20 m² each. There is a walk in closet, the bathrooms are modern and have been refurbished. One bathroom has a large bathtub, walk in shower, double washbasin and toilet, the other bathroom has a shower and wash basin with a toilet. The dining and living area is equipped with a fire place and a direct exit to the glazed naya. From the kitchen you can exit to the back of the villa. This kitchen consists of two parts: main cooking area with a dining table and a separate kitchen which can be used independently. The separate appartment has a living area, an american kitchen, two bedrooms and a bathroom with a shower. Extras: there are three covered parkings and a garage. The garden is mediterranean with typical plants and shrubs, trees and palms. A water well, waterdeposit, automatic irrigation and a laundry room as well as a large work shop and many storage rooms belong to this property. There is central oil heating, air conditioning in all the rooms, there is a large pool terrace with an outside shower and 8x4m pool which has an automatic cover. 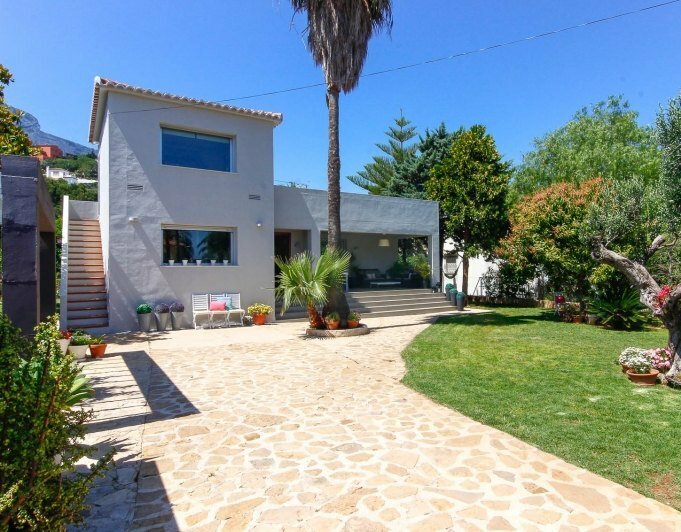 Beautiful villa for sale in Denia montgo area.This nice villa, renovated fully in 2001 surprised by the fantastic views to the sea, Denia and surroundings. With private plot of almost 800m 2, swimming pool, heating, glazed naya, fireplace, heating, automatic irrigation and summer kitchen. The few dorms but as broad spaces do make it ideal for a family of few members but that like to enjoy the quiet, the views, the amplitude and see both the implementation and the exit of the Sun at home.Furthermore there is a fully equipped guest apartment.A place to simply live. Villa for sale in Denia. With its own lush pine forest, this one-of-a-kind property located right next to La Sella Golf Resort in a most sought after area allows you to enjoy unstinted views over the fairways with the spellbinding Montgó massif behind and the Mediterranean sea on the horizon. Built on two levels the upper and main floor hosts the spacious and bright common areas. The hall´s staircase separates the huge lounge with access to the sun terrace and pool area from a lovely modern kitchen integrated in the ample dining area with balcony. A guest toilet and a functional cabinet are next to the hall. Downstairs is the stunning, generously sized master bedroom featuring a walk-in cabinet, en-suite bathroom and a wonderful terrace. Furthermore, there are two more bedrooms next to a bathroom, and it exists the possibility to extend this floor by further living space. This glorious Villa radiates casual elegance, peace and complete privacy as it´s set amid a lush Mediterranean greenery benefitting form the amendments and excellent infrastructure the La Sella Golf Resort is renowned for. The property has not yet been completed. Its price includes all interior finishes including carpentry lacquered in white, the cleaning of the plot and earthfillings of its front side up to pool level, and the construction of an open parking place. Equipment: Central gas heating. Pre-installation for air conditioning. 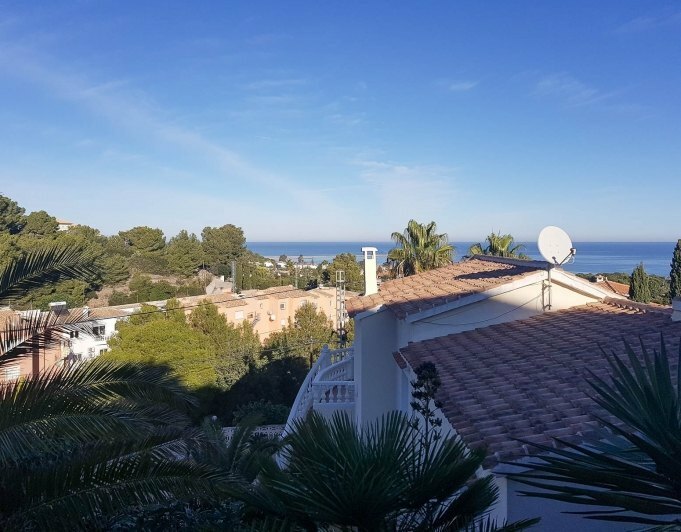 Villas in Denia for sale, In one of the best residential areas in Denia, only 300m away from the town center and all services, the beach and the marina. The building time is 8 months. By law the building has a 10 year guarantee. Realtors Associated, as lawyers, makes every effort to ensure that all properties comply with the new regulations. We require that Private Sellers, Developers and Partner Agents provide all of the necessary certificates. New built to order modern houses very near town, the beach and all amenities. Smal gated residencia with 6 properties with 192 m2 built on plot of 390 to 580 m2, in one of the best areas of Denia only 2 km from the sea and center from the city. 2 floors, 4 bedrooms, 2 bathrooms, 1 toilet, covered and uncovered terrace, Heating, Swimming pool, Garden, Storeroom, Pre-Air Conditioning, Carport. Photos are from the first sold completed house. Built in 9 to12 months. Reserve your plot now. Spectacular views of the sea and mountains from this magnificent detached villa located on the urbanisation of Monte Pego, just 8 km from the quiet Mediterranean beaches.This beautiful villa of 410 m² build and a large 2,040 m plot was built in 2000 on 2 floors. The first floor, (the main living area) comprises of: a spacious livingdining room with lovely sea views, a semiopen kitchen with pantry, a master bedroom with dressing room and a complete bathroom en suite, a second bedroom with bathroom en suite, guest toilet, glazed and open terracing with more splendid sea views. On the ground floor, ( recently renovated ) there are 3 modern bedrooms each with an en suite bathroom, an additional separate bathroom, pantry, laundry room, storage room, boiler room and a large double garage for two cars connected internally within the property. Additional features include further covered and open terracing, a large 9 x 4.5 pool ( incorporating an inpool table and seating area ) and a shower ( h&c ). Obviously such a prestigious property has many extras among which we highlight: fitted wardrobes, wooden beams, gas central heating with radiators, an open fireplace, 9 air conditioning units (h&c), electric water and gas heaters, aluminum double glazed windows with security bars, shutters and a large parking area for 6 cars within the grounds.The property is sold almost entirely furnished, as well as with electrical appliances.A UNIQUE OPPORTUNITY, there is no better villa to enjoy the sea 24 hours a day. Villas in Denia for sale, the plots start from 350 m2 up to whatever you may need. New build, for a new type of lifestyle, looking for open spaces and natural light. Orientated to the south, this way the house becomes more energy efficient. With parking area with rooftop, terraces, private swimming pool, garden, stone walls around the plot with small trees. Inside we can find an entrance hall, small toilet, large dining and sitting area, open kitchen with cooking ilse. A nicely designed staircase, ensuite bedroom with access to terrace. On the first floor there are 2 ensuite bedrooms and a large sunny terrace. Wallking distance to town and supermarkets.